Jens set this record, also that the rules are so much clearer now. He rode 51.115km over the course of an hour Thursday. The 43-year-old German bested Ondrej Sosenka’s mark of 49.7 kilometers by 1.415km. Another record, called the Best Human Effort, placed very few restrictions on the bike and position used. The exceptionally fast “superman” positions of Graeme Obree and Chris Boardman fell under this record. However, In May, the UCI hit the reset button on the hour record, opening the door for a record attempt by Voigt. Both the Athlete’s Hour and Best Human Effort were scrapped in favor of a single hour record with regulations in line with modern UCI track rules. That means that as UCI track cycling rules change, so will the rules for the hour. “Jens Voigt’s performance was sensational. I’m very happy for him,” said UCI president Brian Cookson. “I’m confident that his achievement will have a domino effect: other great riders will resolve to attack one of the greatest challenges in our sport. To start his attempt, Voigt turned in a 23.574-second first lap, understandably slow, starting from a stand still. He needed to average 18-second laps to beat the record. The German rode the first kilometer in 1:15491. He turned in a 6:00.954 time for the first five kilometers, 4.839 ahead of Boardman’s 2000 mark, but behind Merckx’s 1972 record. After the first 10 kilometers, Jens’ time was 12:01.336, which was still ahead of Boardman, but behind Merckx, and slightly behind Sosenka’s splits. It was noted that Merckx’s hour record started at a blistering pace, and the Belgian champion faded in the final half of the ride. After 15 minutes, Voigt was on pace to set the record. When Voigt reached 20 kilometers, his time was 23:39.198, meaning that his average speed at that point was 50.718kph, on track to set a new record. Halfway through the hour, Voigt was still on pace. Nearing the 40-minute mark, he started to show the strain of the effort, adjusting his position, and occasionally rising from the saddle to stretch. With 15 minutes remaining, Voigt was still turning in laps quicker than 18 seconds. Voigt’s split at 40 kilometers was 47:16.668. That split indicated that the world record was within his reach. In the final 10 minutes, Voigt began to push to the finish, riding increasingly faster lap times — some even quicker than 17 seconds. “The last 10 minutes were flat out — all-in,” Voigt said. With less than five minutes left, he fought his bike in the straights, pushing out of the saddle. On his 199th lap with 1:28 left in the hour, he surpassed Sosenka’s mark. 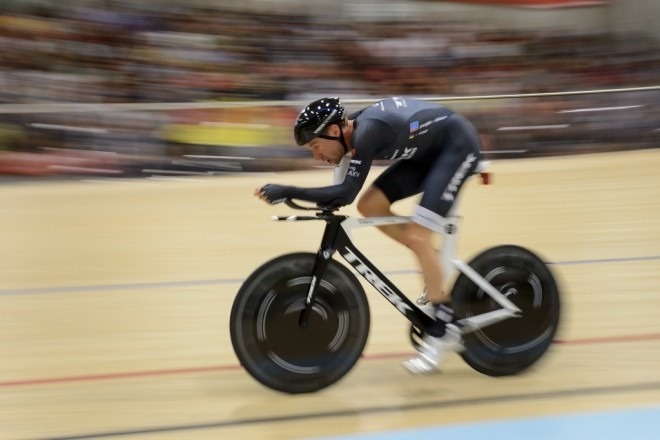 At the end of an hour, Voigt had turned in 205 laps, riding a total distance of 51.115 kilometers, a new world record. “I saw Chris Boardman beating the record in 2000 and I said to myself, ‘What a great way that would be to finish my career,’” he said. “33 years of cycling behind me. This was my last attempt. I’m in so much pain … But what a way to retire! “I remember how Boardman was walking after his effort, and I am not far off from that. I am basically limping. It hurts in my glutes! “Boardman was my first roommate in 1997 and I can’t ask for a better good-bye than this.